Alaba pirates recently arrested by a task force set up by the National Film and Video Censors Board (NFVCB) to have their bail hearing tomorrow the 8th of December, 2017. 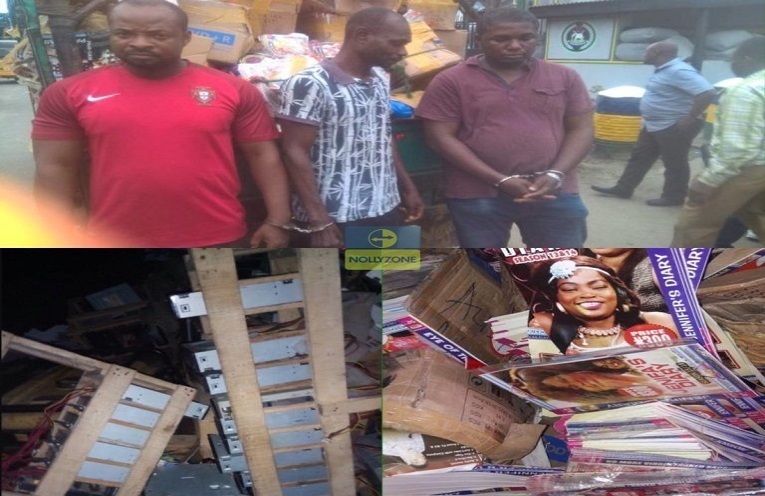 Five movie pirates were arrested on August 12, 2017 at a shop in Alaba International market by a task force set up by the National Film and Video Censors Board. The pirates, David Chukwudi, Austin Igboukwu, Ugochukwu Ukwuagu, Chukwuka David and Ndu Celestine were arrested in a stint operation for unauthorized recording of works such as “Jenifa’s Diary“, “Lord of War“, “The Village War“, “My kids and I“, “What I want“, “Osinachi my wife’’, among others, for illegal distribution. The pirates were charged with copyright infringement, on Thursday, November 30, 2017 at the Federal High court Ikoyi, Lagos. “In the first charge, the prosecutor, Barrister Kehinde Oluwole from the Police Force Headquarters, Abuja, said that Chukwudi, David and Celestine committed the offence on August 14, 2017 in the premises of the Alaba International Market, Lagos. “He said the accused forged packets of uncensored Nollywood films that include “Jenifa’s Diary“, “Lord of War“, “The Village War“, “My kids and I“, “What I want“, “Osinachi my wife’’, among others, for illegal distribution. “Justice Muslim Hassan, in a short ruling, ordered the three suspects to be remanded in prison till the next hearing as their case was adjourned to December 8 and December 12, 2017 while their bail application were also denied till next hearing.